In November 2014, we were fortunate to hear from Richard Milton, who played for Langton Green in his youth in the early 1970s, when the club was just starting out. He very kindly sent us 2 photos of his team at the time. These are shown below, along with Richard's e-mail to us. We would love to hear from anyone else who either features in these photos or who played for or was involved with the club at any other point in the past. Please send us your memories, photographs etc. Last week I was contacted by Jeremy Golding, Mark Oliver and Johnathan Moult. We were founder players of the club when Brian Goodwin set the club up. I have attached a photo of the U14's, I'm front row 1st left. Brian is back row right in the middle back row is Mr Kew. I was very young to be playing for this team. I also played for both U12 teams as well and ended up as Goal Keeper for U12B's. Unfortunately during my trial with Brian he hit a ball from the edge of the penalty area, I narrowed the angle, saved the ball but dislocated my thumb and ended up in Kent and Sussex hospital A&E. I struggled after that in goal not wanting to go through that pain again. I did receive the "Johnathan Moult player of the year". John donated the trophies as he was leaving the area. Do you still have and present the trophies. The photo was taken outside the club house on the Rec which I hear is still there but is due for demolition? We all went to the primary school which we were also the first intake in the building and we are now looking to gather the 72/73 year together, the wonders of Facebook. I'm so happy to see you still play in gold and green, these were the U12 colours when we started and the U14's were white and red. I'll have to ask my brother to remind me of the U14's team player names as this was his year group. I have so many happy memories of Langton Green FC. Forgive my ramblings but Jeremy has open a box of happy memories. Following on from Richard Milton's letter and photographs of his team from the early 1970s, in February 2015, we received the below from Valerie Goodwin, who remembers the beginnings of the club back in 1972. Valerie also made a donation to the club at the same time as writing to us for which we would like to thank her enormously. "Brian Goodwin started the Langton Green Football Club in 1972, an idea which started when he began going to the Rec at the weekends for a kickabout with some local dads. He played for a Rusthall team on Sunday mornings because he loved the game and to keep fit. Playing with the boys made him aware that there may be others who would enjoy having a proper team and a club. With that in mind he hired the Watson Hall for an evening. Much to his relief and delight the hall was packed and he returned home with lots of ideas and a list of people willing to get it 'off the ground'. Doug Kew was one of those who became a great friend and together they shared common ground and had similar aims for training etc. To raise money for kit etc. fundraising became a 'main event'. For many weeks, Watson Hall being the venue for many beetle drives, jumble sales, cheese and wine evenings, always supported and enjoyed. There were many coffee mornings and cake sales, plus getting together raffle prizes and donations. Refreshments at the jumble sale were a great success and raised a lot of money, everything needed donated by families in the village. Brian and family moved from Farnham Lane in 1976 to Northampton, a move for his company to new premises. Sadly he was already receiving treatment at the Royal Marsden but died after only 9 months in Northampton, aged 38 years. His wife and daughter moved back to Pembury and were sad to learn some time after that Doug Kew had died and his son Stephen. Brian and all those families who helped at the beginning would be so pleased that the club has grown and has a wonderful fiesta, exceeding by far their expectations of what the future would bring. "I received a copy of the information regarding old Langton Green Teams, my friend who now lives in Langton Green recognised my maiden name!! My brothers played in both Teams, Ken Woodcraft in the first photo and in the U14’s Alan Woodcraft (front row, centre) and Brian Woodcraft (front row,second from right) – when Brian Goodwin started the Club I do believe my mother, who was a huge fan, obviously with a vested interest, was either Treasurer or Vice President or something if I recall! Her name is Joyce Woodcraft (sadly now deceased). I thought this may be of interest, we all went to Langton Green Primary School, and were indeed the first pupils to benefit from the ‘new’ Primary School in Lampington Row, we had to physically transport a lot of items from the old school I remember at the time, and everything was so so new! Trisha Sutherland (nee Patricia Woodcraft)"
"Further to....My mother (Joyce Woodcraft, who apparently was Secretary in 1972) and Brian Goodwin took the 1972 team, I believe on an outing to see Westham play as a treat...I wonder if anyone remembers that?!" Thank you to Trisha for taking the time to write in with her memories of the club. If anyone else has any photographs or memories of years gone by at Langton Green, we'd love to hear them. In October 2017, we then received the below letter from Chris Crowhurst, who played as part of the first U14 team in 1972. He was able to name a few more players from the team, which we've filled in above. Thanks Chris! 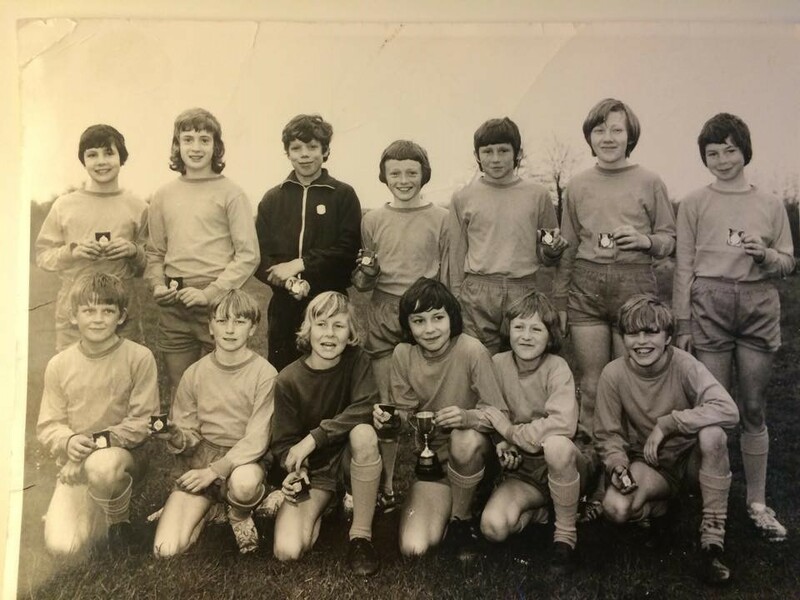 "You won’t know me but I was recently on line trying to find some old photos of Langton Green and came across a photo of the first under 14 team and when clicking on it I came across your website article A Trip Down Memory Lane. I was in that team and the photo and it really did jog some great memories and it was also nice to read the second part from Valerie Goodwin, Brian’s wife. When Brian set-up the team I can remember all the fund raising and the fact that a farmer let us have the bottom field for our football pitch (not sure if you still use it) it was the last pitch after the Langton senior sides pitch. We spent so many hours turning this field into a football pitch over a few months which was hard work but worth it. I think our first game was against Broad Oak and we lost 19-0 again I think. I can name a few more in the photo, back row left to right Mr Vine, myself Chris Crowhurst, not sure of the next two, Doug Kew, I think the next was one of the Peters brothers, Graham Robinson, not sure, Brian Goodwin. Front row left to right, Richard Milton, Norman Rensure, not sure, Brian Woodcraft, not sure, I think another of the Woodcrafts and last is Andrew Vine. It would be great to name them all but have thought hard and can’t get anymore. Anyway great times, great memories and having recently been back to Langton to visit my mother we actually took a walk up to see my old primary school and the new pavilion which looks great, no more cold showers. "It’s hard to believe you have over 500 players as at the time Brian started it I think we had around 30 players between the then two teams under twelves and under fourteens and that was mainly down to Brian’s drive and passion. One thing you probably don’t know about Brian is that he was a superb drummer and had a couple of hits in the 60’s with his band, I only found out as I am a drummer and in the early days he would knock on my door when I was practising and show me how it should be done. It really is fantastic that the club has grown and grown from such a small and minimal start. Please feel free to forward my email as it would be a privilege to see it on the club's website."